K-State Geology faculty member, Dr. Aida Farough, has been invited to participate as a Petrophysics (Physical Properties) Specialist on the International Ocean Discovery Program (IODP) Brothers Arc Flux Expedition (376) that will take place in summer 2018 (Figure A). The aim of the cruise is to investigate the processes that give rise to submarine hydrothermal deposits in an arc environment. Such deposits are thought to be important analogs for porphyry copper, epithermal gold, and various volcanic rock-hosted massive sulfide deposits mined on land. 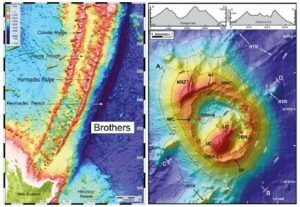 Drilling Brothers volcano (Figure B) will enable cruise participants to reconstruct the local volcanic stratigraphy and provide new information that will improve our understanding of the formation of these economically significant mineral deposits. Expedition participants will also be able to study directly the implications of magma degassing for the transport of metals to the seafloor and how this affects the functioning of microbial life. Operations will focus on discharge zones with geochemically distinct fluids in and around the caldera of Brothers volcano. Because of the shallow water depths, high volatile contents, acidic fluids and high metal contents in the submarine arc environment, it is anticipated that fluid compositions will be very different from those produced in submarine extensional settings (e.g. mid-ocean ridges). The resulting mineralization is, therefore, likely to be very different as well as any associated microbiota. Watch this space to learn more about Dr. Farough’s exciting cruise activities as these unfold. Figure A. Bathymetry of the Kermadec Arc and Trench with major tectonic elements labeled; Brothers Volcano is located on the volcanic front in the southern half of the arc (from de Ronde et al., 2012). Figure B. Detailed bathymetry of Brothers volcano and surrounds. Dashed lines are structural ridges. Letters designate North fault (NF), South fault (SF), North rift zone (NRZ), Upper Cone (UC), and Lower Cone (LC), NW Caldera (NWC), W Caldera (WC), and regional tectonic ridge (RTR). Letters A -B and C-D are endpoints for the bathymetric cross sections shown in the top panels. Red dots mark the locations of the ocean bottom hydrophones (OBHs). Contour interval is 200 m (modified after Embley et al., 2012).